MRTG for SQUID gives you a detail idea of what is happening behind the scene. In this tutorial I'll make sure that you will successfully set up one like below. snmp_access deny allThe first line defines the port SNMP is listening on squid. Second line defines public as the community string or lets say password. Third line defines that from localhost snmp query can be made to squid. Fourth line denies query from all. 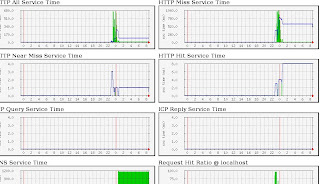 (except localhost)Now you need a web server to serve the graphs. Now you need to configure apache. Lets just host it in a simple way. Now lets make graph for squid. Run this for three times. Its OK for now to see few errors.
" HTTP all service time"
" HTTP miss service time"
" HTTP near miss service time"
" HTTP hit service time"
Total time taken for the request including DNS, cached objects, new objects. Total time taken to retrieve objects that are not in the cache. Total time taken to serve objects from cache. Am I right to say that the squid proxy is responding to each users' request at an average of 17.0ms and at 23.0ms currently??? 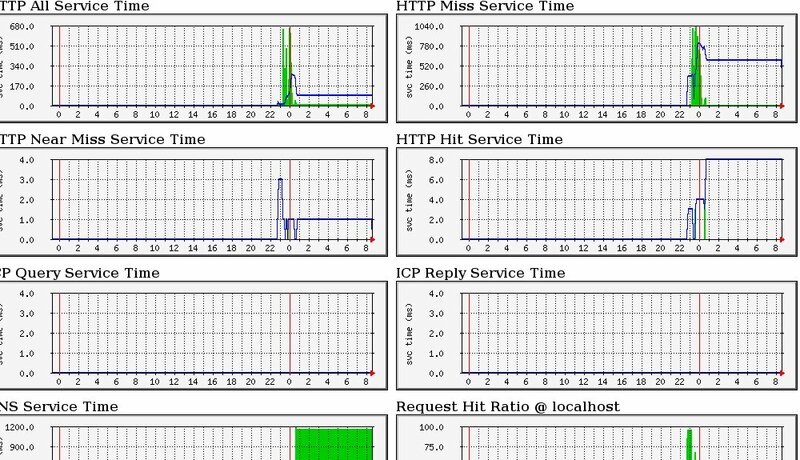 would like to know how was the HTTP all service time being determine, how was it being calculated/showed in graph and can this timing be found in the access log??? thank you for the page. As I am using common logfile and there is a parameter %tr. Is this parameter the same as the total time in native log??? Kindly also advise how can I find out the maximum server requests or maximum number of clients that a server with dual CPUs and 2GB RAM can support?? ?